Johannes, Jan or Johan Vermeer was a Dutch painter born in 1632 in full Dutch Golden Age, period I commented in the post of Cuyp. His father dies at young age, leaving him the family business in the trade of art. For marrying a wealthy woman, Vermeer can devote entirely to painting, although his production is scarce: only 34 paintings are acknowledged as his. This is generally attributed to the fact that he was a slow worker, as he was very careful in painting one canvas at a time and he could only finish 3 per year. He fundamentally painted interior domestic scenes of the middle class. His work is recognized for the effective use of light and the use of unconventional colors, such as the pigments lapis lazuli or ultramarine, extremely expensive at the time. Today’s work was known as Woman weighting gold, however, an analysis revealed that the balance of the woman isn’t weighing anything, so it was re-baptized as Woman holding a balance. In some places, I read that it took a microscopic analysis to determine this. But, come on! Was this necessary? I mean, you can see the balance is empty with a naked eye! Well, it doesn’t matter. The painting portraits a pregnant Young woman holding a balance with her right hand. Some say that was Vermeer’s own wife, Catharina, who served as a model for the painting. In the scene, we see the woman in front of a table which has on a cloth a jewel case with gold and pearl jewelry. At the left, we see a wall with a mirror and, although we cannot see it, a window from which the light enters the room. In the background, we notice the painting The last judgment, from an unknown artist, probably property of Vermeer, inherited from his father. The woman seems far away from any type of external interruption. Peacefully, she looks at the balance in order to even it up and that’s why many consider that she is weighing something different, deeper than the jewelry she has in front of her. 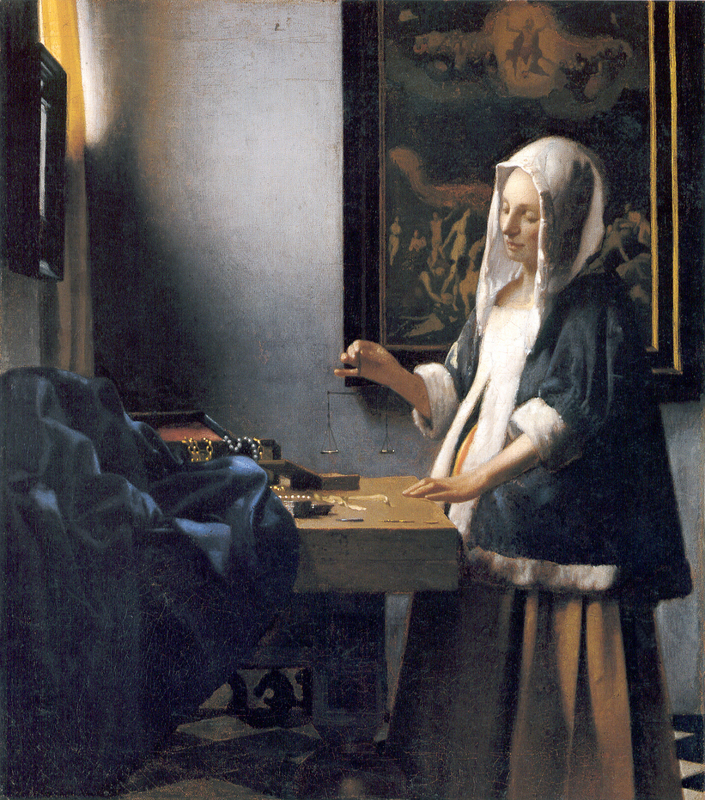 Vermeer takes an everyday activity to the eternal realm with an image that invokes peace, tranquility and balance. The soft light illuminates the woman with her white cap and reminds us the classic representation of Mother Mary. This feeling of harmony and peace is also caused by the composition, which Vermeer thought it was essential. If you trace diagonals over the painting, you’ll find that the fingers of the woman holding the balance are placed in the exact centre of the work. Like so, if you continue with the projection of the lines, the lower and left borders of the background painting divide the composition in 4 equal planes, balancing a work that it is already even up. Although I prefer more expressionistic paintings, I have no doubt in saying that, for all of the above, Vermeer was one of the greatest artists of all time. ~ by Álvaro Mazzino on September 30, 2010. This entry was posted on September 30, 2010 at 11:47 and is filed under Baroque.You can follow any responses to this entry through the RSS 2.0 feed.You can leave a response, or trackback from your own site.